The “Dinamita” has once again exploded after a defeat last year with Timothy Bradley and it’s a big win for the Mexican fighter. 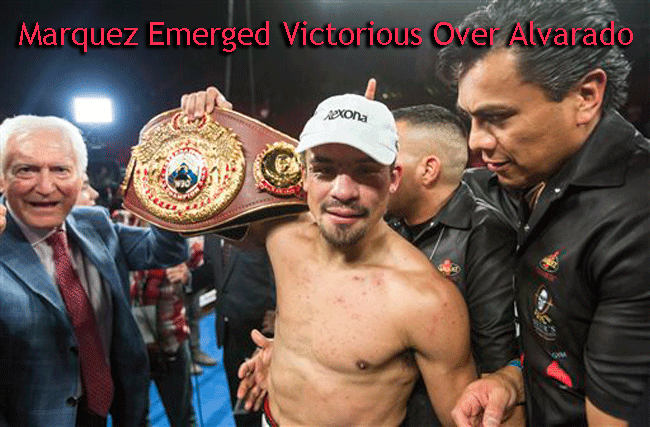 Juan Manuel Marquez (56-7-1) emerged victorious by unanimous decision over Mike Alvarado (32-3). The fight took place in The Forum in Los Angeles on Saturday night. Truly, Marquez has shown power on the right for this big win. Looking at the scorecard, 117-109, 117-109, 119-108 all for a wide unanimous decision for Dinamita. It was not an easy fight for Dinamita and he was challenged a lot by the younger Alvarado. At round 9, he was dropped by the young boxer. Looking at the fight of the two, they both tried to give themselves the best comfort and who will outclass will win. Marquez went through a rocky road fighting Alvarado but in the end, the result was favorable with him. The Top Rank Boxing and HBO Boxing expressed their appreciation for Marquez’s enormous strength shown to overpower Alvarado. Now, talking about his next fight wherein the name “Pacman” is on the limelight, Marquez is not yet sure about it. At this moment, he just would like to celebrate his victory over his younger opponent. We have known a few days ago that Marquez appreciated Pacquaio for his victory with Timothy Bradley. Marquez defeated Pacquiao on their fourth encounter by a technical knockout on the 6th round and it was a big and unexpected win from Dinamita. What could possibly be Dinamita’s next assignment? Let’s see.